It doesn't appear that Jim Schwartz intends on making any major moves in his secondary. In the Philadelphia Eagles' 26-23 overtime loss to the Tennessee Titans, the Birds were torched through the air by a weak Titans passing attack, to the tune of 344 yards. That poor performance came two weeks after the Eagles gave up over 400 yards to Ryan Fitzpatrick and the Tampa Bay Buccaneers. As such, observers of the team wondered if changes would be made, especially considering the poor play of a number of players in the secondary, as well as the loss of Rodney McLeod with a torn MCL. 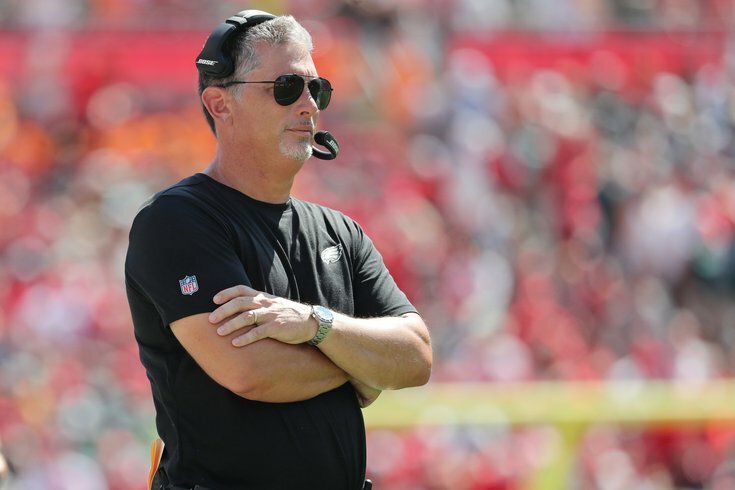 On Tuesday, Jim Schwartz was peppered with questions about his secondary, and he indicated in depth that no major changes were forthcoming. Let's take his words and organize them by topic. Will Jalen Mills' role change in any way? No, per Schwartz, though he did acknowledge that Mills has not played as well as they'd like. "I'm firmly behind Jalen Mills as a corner," he said. "One of the reasons we had a big parade on Broad Street was Jalen Mills. And he's played a lot like a 2-2 corner. We have played a lot like a 2-2 defense, played a lot like a 2-2 team right now. There have been inconsistencies all around, but it's our job to help him through that. It's his job to get out of that, and I'm firmly behind Jalen Mills. That guy's played a lot of good football for us, and he epitomizes a lot of things we're about defensively: toughness, competitiveness and ability to bounce back. And I'm confident he will." So no move for Sidney Jones to the outside in favor of Mills? "He's played suspiciously like a 2-2 player also," Schwartz said. "He made a play on the sideline, the first play, I think it was him and Malcolm had a switch on a pick route. And came and made a great play. Big third-down stop for us. But then later on, he had his warts also. And he had a hand in a lot of those plays also and he just needs to work on being more consistent at the nickel position. "We're excited about him. He has made some really good plays. I think one that fell below the radar, we never talked about it last week, was he made a tackle on the blitz. It was an incredible effort. There are good things. He's trending in the right way. We have a lot of confidence he can play outside. If he's asked to do that, I'm sure he'll do a good job." What was the plan at safety on Sunday? It was a combination of Corey Graham and Avonte Maddox, who has never played safety, and only began getting reps there in practice last week. "When it came time to replace Rodney, who will be sorely missed this year... he'll be back, but we certainly felt his loss," Schwartz explained. "He's been such an important part of our team. "When we replaced him, we compartmentalized it into two positions: one was Corey Graham and the other one was Avonte. Of all the guys on our roster, we thought Avonte had a lot of the same traits that Rodney had. With Avonte playing the nickel position -- there's a lot of carryover between nickel and safety, also. So even though some things are new he's got excellent quickness and great eyes for the football. He's got the combination of being able to cover and being able to play the run. All the things we liked about him as nickel, we also like about him as a safety. And I think we'll see more of him going forward in that role." So does that mean that Maddox will begin to see an increased role at safety in favor of Graham? Perhaps. Schwartz was asked about Graham playing every defensive snap on Sunday, 71 in total, and whether or not that was realistic for a 33-year old player like Graham. "That's probably a lot (of snaps)," Schwartz said. "Short term, you can do a lot of things short term. Long term, it's probably a little bit unrealistic long term, but we'll see how it goes going forward. We're comfortable with him in roles that he's played for us and he's had to step up and play increased snaps at different points. But we'll just see going forward." So how did Maddox look in his first showing at safety? Meh, but they think he'll be better. "I'll stay with my talking point," said Schwartz. "He played like a 2-2 team. He made an interception and got us a score, and then had a one-on-one slip. That’s part of your being a player and gave up the play. Did some good things, obviously, and some things that we can improve on for sure. But the thing we like about him is that Avonte is another guy that's very competitive. He's quick. He's really smart. We really like him as a player and that was a good chance for us to be able to get him on the field." So no Rasul Douglas at safety? "He does get cross-trained a little bit," Schwartz explained. "He's mainly an outside corner. We think that best fits his skill set. He's always ready no matter the situation. We saw that in the opener, had to come in for just a couple plays, and he made plays. He did for us last year. We have confidence that if he's called on, he'll do the same thing for us this year." But Rasul is 6'2, 209, and Avonte is 5'9, 184. Doesn't Avonte's size work against him at safety? Schwartz doesn't care much about size in his safeties. "The thing about that is that was one thing said about Rodney also," Schwartz said. "They're not a whole lot different as far as height. Avonte is maybe a little bit lighter. I think Rodney had some of those same things, he played corner in college. Avonte gives us great range, he's quick. He's a smart player. He's just a little bit inexperienced and each rep he gets he will get better for us." So how about safety options outside the organization? Any interest, Jim? "To quote Malcolm Jenkins, ‘We're all we got. We're all we need,’" Schwartz said. "We're confident that we can cover anything with the guys that we have in the room."